FORT WORTH — In a corner of the Shannon Rose Hill Cemetery, close to a chain-link fence that separates the living and the dead, a patch of ground has been worn free of grass by all who come to stare at one particular gravestone. With just a surname, the marker says it all: OSWALD. But in the half-century since a slight, sallow man named Lee Harvey Oswald killed President John F. Kennedy, so much continues to be said about the assassination that the various conspiracy devices and theories are nearly as familiar as the tragic event itself. The Magic Bullet theory. The Zapruder film. The Umbrella Man. The Mafia. Jack Ruby. Fidel Castro. And, of course, Nick Beef. Or, more accurately, NICK BEEF. For the last 15 years, this curious name has vexed the obsessive assassination buffs who make regular pilgrimages to the Oswald plot here in Fort Worth. That is because a pinkish granite marker suddenly appeared beside the assassin’s grave sometime in 1997. And all it said was NICK BEEF. In their quest to make sense of a national catastrophe — to find a narrative more acceptable than that of one gunman, acting alone — some theorists have tried to divine meaning in a name that, more than anything else, evokes a private eye who specializes in agricultural intrigue. It added another question to their already exhausting list. That is: Who WAS Nick Beef? To begin with, Mr. Beef remains happily above the clay. Affable, with gray-black hair slicked back, save for a stray curl or two, he sips tea at a cozy table at the Jack bistro in Greenwich Village, not far from his Manhattan apartment. With evident pride in possessing one of the more distinctive conversation starters in American discourse, he confirms that he owns the burial plot beside Lee Harvey Oswald’s. As for his notoriety among the conspiracy cognoscenti, he says, he came by it innocently, even accidentally. But now, with the 50th anniversary of the Kennedy assassination less than four months away, he has decided to reveal himself, sort of, to The New York Times. This scoop may not definitively link Castro, the mob, and the Central Intelligence Agency to the Kennedy assassination, but, hey, it’s something. And to prove that he is who he says he is, Mr. Beef reaches into a small satchel and pulls out a contract from 1975 for Burial Plot 258 in the Fairlawn section of Rose Hill ($175), as well as a receipt from 1996 for the purchase and installation of a granite stone to be engraved NICK BEEF ($987.19). Mr. Beef, 56, is a writer and “nonperforming performance artist” with a penchant for the morbid, he says, who has never done stand-up comedy — an important point. He says that Nick Beef is a long-held persona; his given name is Patric Abedin. Here is his story. On Nov. 21, 1963, President Kennedy and his wife, Jacqueline, landed at the former Carswell Air Force Base in Fort Worth as part of a two-day Texas tour. Among the many gathered for the arrival — some holding “Welcome to Texas, Jack and Jackie” signs — was young Patric, the 6-year-old asthmatic son of an Air Force navigator. Having gotten lost in the crowd, the boy was sitting on the shoulders of a military police officer when the first couple passed by just a few feet away. The future Mr. Beef was Mr. Popular the next morning at Waverly Park Elementary School, as he regaled his first-grade classmates with his presidential story. They soon went outside for recess, while his asthma kept him indoors. He was alone, then, when the principal announced over the loudspeaker that the president had been shot; alone, too, when the principal followed up to say that the president was dead. As his class returned from recess, he told his teacher what he had heard. At first she suspected that he was vying for more attention. But soon, as everyone of a certain age remembers, classes were abruptly dismissed amid the weeping of teachers. A young boy’s life continued. His father took him to the World’s Fair in New York. His older brother broke his jaw during some horseplay. His parents divorced. At the age of 10, he survived a car crash that killed a 9-year-old friend. Around the same time, he and a friend were trying to make each other laugh while driving to Dallas from Lubbock. Stopping at a bar and grill, his friend decided to become Hash Brown; he declared himself Nick Beef. A joke. Upon hearing the name, the official put down his pen. But he picked it up again when the customer pulled out a credit card in the name of Nick Beef. With the gravestone planted, rumors and speculation took root. It was said that since the cemetery refuses to provide directions to Oswald’s grave — at the family’s request, a spokeswoman for the cemetery said — two reporters had bought the plot so that the curious could ask instead for Nick Beef. It was also said that Nick Beef was a New York stand-up comic who used references to the grave in his act. Assassination buffs swapped theories on the Internet. Knight. Leap. Castle. Spear. Bishop. Queen. Downs. King. Chek. Mate. Yes, he admits again, he has a penchant for the morbid. But this does not mean that he bought the plot next to Oswald’s as a joke, or a piece of installation art, or anything of the kind. It’s personal. It’s about change. The fragility of life. Something. 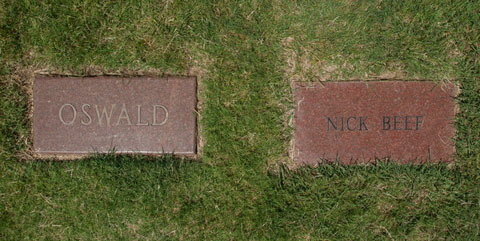 And no, Nick Beef will not be buried inches from the man who killed Kennedy.